Once my wife told me about Traveler’s Joy and all the things they had to offer, I was excited about what the possibilities could be for a once-in-a-lifetime honeymoon. I can remember Carol looking like a little kid that got a cool toy to play with when she was creating the “trip of our dreams” – and it certainly was. My wife and I met more than 22 years ago when I was playing in the pit orchestra of a musical and she was one of the actors/singers in the show. We had a few conversations, but that’s all. We didn’t see each other again until 19 years later at a preview performance in the very same theatre when I was again playing in the orchestra. When I walked into the lobby, there she was. There was my Carol. When I walked up to her and said hello, lucky for me, she remembered me and we talked and talked as if no time had gone by. At the end of the night, as I was going to pull out of my parking spot, I stopped and said to myself, “You need to go in there and talk to this woman.” Well, I mustered the courage to do it and I’m so glad I did. I feel our parents were involved in the two of us finding each other – again. Both of our parents fell ill once they got older and we were the children that took care of them. Maybe they met on the “other side” and our mothers said to one another, “Hey, your kid helped you, too? Let’s try to get them together.” You know how mothers can be. We planned our honeymoon around a pre-planned week’s stay in Stratford, England, where I had a gig playing classical guitar for a sightseeing tour. The more we talked about our plans, the more we knew we wanted to see Paris and various places in Italy. I had been to Rome and Carol to London and Paris, and we couldn’t wait to show each other these beautiful and romantic cities. And, of course, we couldn’t miss Venice on our honeymoon, a place where neither of us had ever been. The fun started in London at a B&B situated in a great area, when after a nap to help with any jet lag, Carol and I braved a cold, rainy night of walking to see the musical “Wicked.” Both the B&B stay and the tickets were registry gifts. In every city we visited we had at least a day tour to get the lay of the city and get to know our way around, but we also used public transportation to see things on our own. We loved it! In London, we saw some of the town and then had a great tour guide who brought the English royal history to life when visiting Windsor Castle and Bath. We also froze our you-know-what’s off at Stonehenge. Bring a parka and gloves! While in Stratford for the next week, we saw sights all around the River Avon and I was able to play a classical guitar piece from the altar of a small church built in the 1400s for our group. Talk about goose bumps! After Stratford, we continued honeymoon on our own. It started with a Eurostar trip through the Chunnel to Paris where we stayed in a small hotel in Montmartre – another TJ gift. We were enchanted with the Eiffel Tower, left speechless at the Louvre Museum, and fell in love all over again at a formal dinner cruise along the Seine, which would have been difficult to afford without TJ. We thought we were lucky to catch the overnight train from Paris to Milan during a strike, but, unfortunately, not only did the plumbing not work properly, but the air conditioning in our cabin was stuck on hot. When we opened the window to breathe, it was too cold, loud and smelly to sleep. 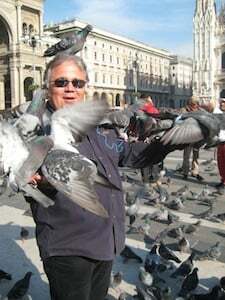 Our lifesaver was a welcoming innkeeper at our B&B at his apartment outside of the center of Milan. He let us check in early, take a nap and even gave us an extra breakfast at no charge. We loved our walking tour and seeing the beautiful stained-glass windows at the Duomo, with the prerequisite plethora of pigeons in the plaza, the historic La Scala Opera House, and ultimately the Last Supper, which has a totally unexpected history and is truly awe-inspiring. Our next train stop was romantic Venice. How could you not come to such a romantic place on your honeymoon? It’s amazing considering the amount of people that come here from somewhere else just to see what it’s all about and to witness for themselves the joys of eating fresh pasta, seeing beautiful hand-crafted masks, or taking a gondola ride. Then there’s the experience of just sitting at a table and enjoying the shade of your table’s umbrella as you drink a fine glass of Chianti and people-watch. In our case, people watching meant seeing a whole flock of sparrows eat a discarded pizza near us. Our last night was a very romantic dinner at the base of the Rialto Bridge, yet another gift from generous friends. We left Venice just in time to avoid a threatened rainstorm, but it followed us to Florence, where we checked into a perfectly located hotel where our bedroom had amazing frescoes on the ceiling. We took another walking tour and then in the evening came my favorite experience, a Tuscan cooking class at a local cooking school where we learned to make simply sinful dishes like tiramisu and roasted chicken with capers and mushrooms. My friends couldn’t wait to gift me with this treat. 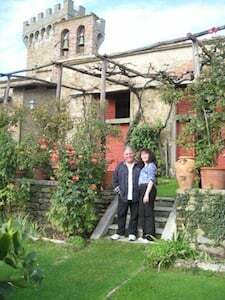 Next, we rented a car to drive through Tuscany to the Castello di Gargonza, an old castle turned hotel near Monte San Savino where I proposed the previous year when I was lucky enough to be asked to conduct an opera in Monaco. I felt that in order to ask the ultimate question to the perfect lady, you need the perfect location and the castle garden was certainly that. This time, however, we were there on a weekday and had the whole castle to ourselves. We didn’t know what to do first, go on a stroll along the hillside looking down onto the beauty of Tuscany, or light a romantic fire in our room’s fireplace. Ahh! It was stuff like this that made a few of our friends go on our website to see where we were on any given day. From Gargonza we drove to Rome, which should have been an hour’s drive to the train station to drop off the car at the rental place. I wonder, does Roma mean, “Land of the One-Way Street?” Even the locals told us they didn’t know from one week to the next the direction the streets would go. Trastevere was a great area to stay in, but our B&B was an adventure with blackouts, ice water showers, no toilet paper, garbage can or paper for the computer, and no breakfast. Not our best choice, but in spite of this, we had a fabulous time. I loved showing the beautiful and historical city of Rome to my new bride. She loves ruins and the city was everything she could have wished for – from the inside of the Colosseum, walking the main streets with all of the excavations, to the Pantheon, and the Trevi Fountain. We were entranced the next day seeing Pompeii, which Carol had wanted to visit since high school. On our last day, it was my turn and we spent the whole day exploring Vatican City. What an overwhelming and amazing place. I could feel my mother with me the entire time. Our nearly four-week honeymoon cost a little over $11,000, but since we received over $3,000 due to the ease of gifting through Traveler’s Joy, we were able to see and do so much more than our original budget would have allowed.